How Low Do the Markets Go ? CRONKITE Thu Jul 31, 2014 11:20pm EST Comments Off on How Low Do the Markets Go ? Point wise, today did not feel like a good day. Volume wise, we seem to have nothing to worry about. The DOW looks worse than the S&P partly due to the fact we have reached the level where the year began. The next key level to watch is 1905ish on the S&P. Below that there is a lot of support at 1850ish S&P. 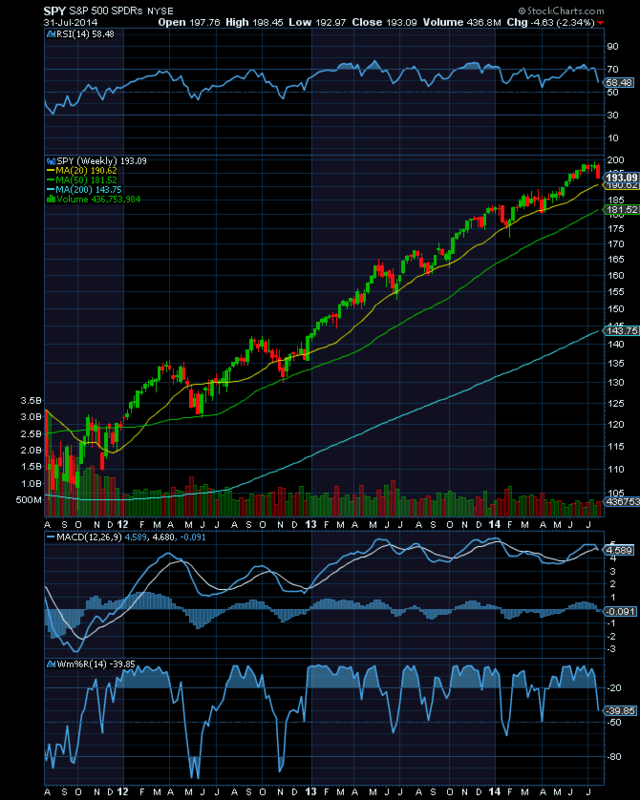 RSI, MACD, & Williams all indicate we have some more room to fall, but i would be surprised if we fall much further. I would bet on a intra day test of S&P 1905 and then some type of reversal. If we have a stellar jobs report tomorrow then expect the market to fall a bit as the pundits of spin are creating fear over the fed rasing rates sooner than later due to some inflation and improving labor conditions. Let’s face it, the employment scenario for many, many, many citizens is still terrible. Also the smart money knows that off balance sheet losses for the big banks is still a major problem; so ZIRP should be in force and there should be no reason to fret about rates moving higher sooner over later. A worst case scenario would be to see some heavy volume taking the S&P down to the 1815-1830 level. Chances are we do not see this level as the market has that teflon resilience in play. To be safe, I’m taking half my money off the table hoping the S&P heads lower to give me a good buying opportunity. Luckily, i’m up around 42% for the year so taking some profits would not be a bad thing. If i do not get the buying opportunity i’m looking for then i get to redeploy funds into more issues creating more risk tolerance in a slightly volatile sketchy market. May the markets be on your side.